The Holiday Season is almost upon us, and although I have the best intentions of sending Christmas cards, I never ever get around to it, in fact I probably wouldn’t have a Christmas tree if I couldn’t order that online. Every mother knows success in life is about those extra twenty minutes in a day, whatever corners you have to cut to get there, most importantly abandoning family traditions. Why send a Christmas card when you have a blog and facebook and twitter! I have been inspired early to start posting about the holidays by Patience Brewster, an artist and a designer of beautiful Christmas ornaments. Check them out at this page. Ornaments even a derelict mother can appreciate! Every Christmas my mother very generously gives everyone in the family a Christmas ornament and my uncle has also started bringing ornaments back from his travels. Eva is still young enough that her favorite thing about Christmas is the tree, and well maybe I am now finally old enough that we share the same love: the tree, the lights, the ornaments, the smell as it slowly dies, those pesky needles that get everywhere. There is one level to which I will not stoop- the plastic Christmas tree. That is never happening in my house. When I finally purchased my first Christmas tree in the dawn of my delayed adulthood I had about five ornaments, mostly hand me downs from my mother. She was really disappointed I had not spent half of my pay cheque “investing” in ornaments, but really she was even more depressed that I didn’t have any children to make them for me. The glitter and glue star that I made out of popsicile sticks is enjoying its thirtieth Christmas this year, on her tree. It was around this time (the dawn of my delayed adulthood) that she started a tradition of her own, we call it: tree inspection. A few days later we would get the tree up and she would again drive by. A few days later if she sees anything hanging off the tree, the star, a Christmas Mickey Mouse, or her ornament, she arrives, dressed head to toe in red and green, with a santa hat, and musical earrings playing “Joy to the World.” She looks the tree up and down, shaking her head. If I didn’t distract her she would start rearranging the ornaments. I think she thinks of a Christmas tree as some sort of emblem of how well you are doing in life, how creative, how affluent, how organized, how family orientated and how much you care about Christmas, and lets not leave out Jesus Christ. He should be at the top of every Christmas tree. I had no answer for that so she bought a Fisher Price nativity on amazon to be kept at Hamma and Gigi’s house. Of course Eva loved it, and has not stopped talking about Baby Jesus and Gigi’s perfect Christmas tree ever since. Personally I would like a tree that leans a little to the side, a tree with character. I am really suspicious of people whose trees look like they shoplifted one from the department store, or stayed up for seven consecutive nights decorating it. Why? My mother would disagree. She has been known to try and return her Christmas trees for not having the perfectly shaped form. Maybe she should think about a plastic tree? Personally I embrace the imperfection of nature, and imperfection in all its forms. 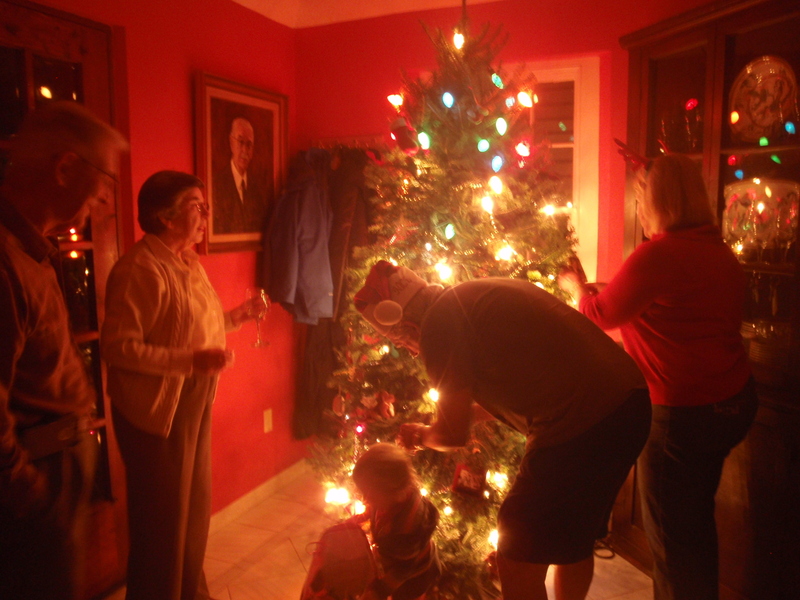 This entry was posted in Age 2, Chapter 11 - Month 11, Derelict Grandmama, Uncategorized and tagged Christmas, Christmas ornaments, Christmas tree, derelict mom, funny mom, Mom Funny, Patience Brewster by derelictmom. Bookmark the permalink.